The ’80s were a disease. It’s not necessary to have been alive in the ’80s to know this. For every piece of pro-’80s propaganda still making the rounds in pop culture, there’s a stark counterpoint—a reminder that the decade was largely a stifling wasteland of conservatism and sameness dominated by, to quote Duran Duran, cherry ice cream smiles. Devo shoved a tongue depressor down the throat of Reagan’s America with “Beautiful World;” David Lynch did the same with Blue Velvet. Rather than being antidotes, they were Band-Aids. Gangrene had set in, and no amount of artful, quirky commentary was going to fully diagnose the rot. Instead, “This Corrosion” did the job. “This Corrosion” came out in 1987, the product of a band called The Sisters Of Mercy. Named after a Leonard Cohen song (itself named for the order of Catholic nuns) and fronted by an Iggy Pop sound-alike, the Sisters hailed from England. Yet, frontman, Andrew Eldritch, clearly had a thing for North America. His biker-chic image was straight out of The Wild One: black leather, greased hair, dark shades. Like The Jesus And Mary Chain—another leather-clad, religiously named band from the British Isles that paid homage to its selectively hip vision of ’60s Americana (girl groups, The Beach Boys, The Velvet Underground)—The Sisters looked in the rearview for inspiration. Eldritch’s Iggy worship was undeniable, as were his subtler undertones of The Doors, Lou Reed, and the swagger of ’70s hard rock. That was lost on many. Starting with The Sisters’ breakthrough single, 1984’s “Temple Of Love,” the band got widely tagged as goth. Eldritch always resisted that simplification, but it was no use. By the release of “This Corrosion,” scattered packs of Eldritch clones wandered suburbia, dressed in trench coats and glaring malevolently. Or crying. Who could tell under those glasses? Last year’s conclusion to The Cornetto Trilogy, The World’s End, simultaneously spoofs and celebrates that whole generation of ersatz Eldritches. In the film’s prologue, set in 1990, the teenage version of Simon Pegg’s character, Gary King, is a Sisters-obsessed scumbag with delusions of sexual omnipotence. It’s a caricature—but like all good caricatures, it teases out the essence of its subject. As much as The Sisters are called goth, this is not music for shrinking violets. It became the anti-anthem of a jingoistic decade in dire need of one: aggressive, decadent, magnetic, metallic, and in the case of “This Corrosion,” downright operatic. 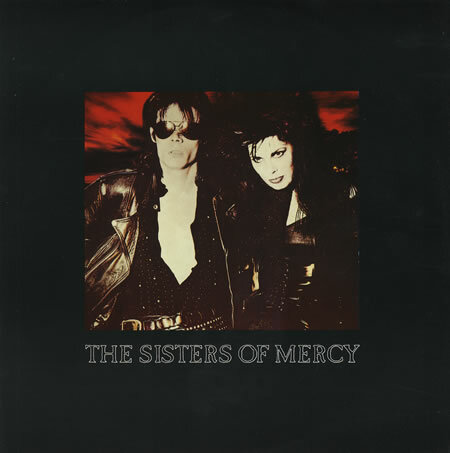 Judging by the cover art of The Sisters’ Floodland—the album that “This Corrosion” appears on—the band is made up of two primary members: Eldritch and Patricia Morrison, an American who had previously played with influential punk groups The Bags and The Gun Club (and who would later join one of punk’s founding outfits, The Damned). However, there’s a far less punk collaborator who loaned his passion and vision to “This Corrosion,” and that’s Jim Steinman. The mastermind best known for making a megastar out of Meat Loaf saw something malleable in Eldritch—who, it must be noted, approached Steinman in the first place—and wound up producing part of Floodland, “This Corrosion” included. Even if Steinman had done so anonymously, the song would have been a dead giveaway. Who else could have accounted for the Sturm und Drang pomp, the grandiloquent melodrama, the orchestral brobdingnagianism? Floodland even boasts a staggering, 11-minute version of “This Corrosion” that gives Eldritch and his ravenous baritone three times the scenery to chew. Does that mean Andrew Eldritch circa “This Corrosion” is basically just Goth Loaf? Well, yes. But Meat Loaf in goth clothing can be—and in this case definitely is—a wonderful thing. All that’s missing from the song’s video is a demonic motorcycle. Filmed on a generically dystopian, Thunderdome-esque set that looks left over from the shoot of Duran Duran’s “Wild Boys,” the video is as gloriously overblown as the music. Amid brassy bursts of choral accompaniment and Wagnerian thunderbolts of guitar, Eldritch poses and preens, waving a walking stick like a mad surgeon with a giant scalpel—the skeezy supervillain of the first Bond movie made after the nuclear apocalypse. When he snarls the line, “I feel an animal deep inside,” he may be talking about either his own feral nature or the still-squirming lizard he just gulped down to fend off starvation. Not coincidentally, the set of the video is a lot like of the one used in the final scenes of The World’s End. Like each of the installments of The Cornetto Trilogy, the film is an homage to a certain package of pop-culture signifiers—not to be used as glib references, but as the contexts for specific emotional and thematic arcs. In this case, nostalgia is given a kick in the nuts: What happens when a nihilistic kid bred in the void of the ’80s grows up to realize that the world doesn’t end? That cultural gangrene may lead to the decay of idealism and hope, but the body still staggers on? That this corrosion may, in spite of itself, morph into this reincarnation? Or as Eldritch intones with stentorian gravitas at the end of “This Corrosion,” “Run cold / Turn / Cold / Burn / Like a healing hand.” The ’80s may have been a disease—but at least they gave The Sisters Of Mercy plenty to amputate. via The Sisters Of Mercy mixed goth with Meat Loaf—and turned it into gold · The Single File · The A.V. Club.